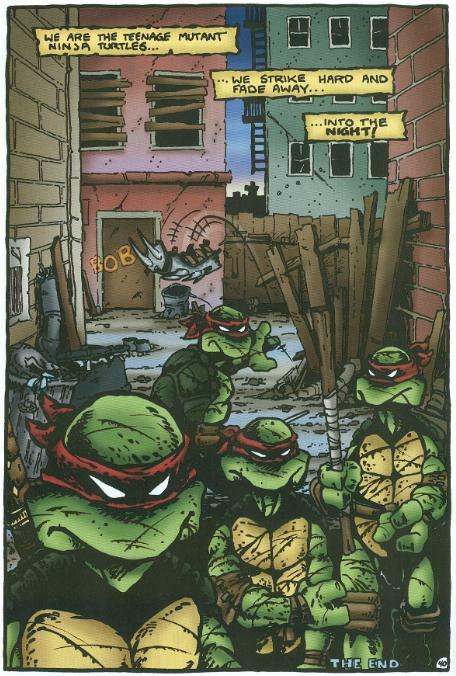 Mirage’s TMNT (Vol. 1) #1 is what started it all. 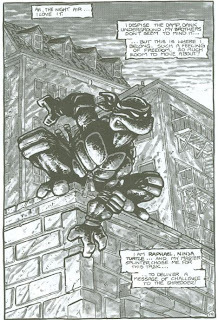 As the foundation of the entire Teenage Mutant Ninja Turtles franchise and mythology, you can bet that Mirage, and now Viacom and IDW, have found any excuse they can muster to get the thing back in print and in the hands of hungry fans. 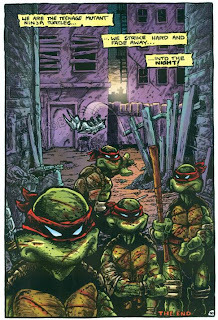 One of the most surefire means of getting TMNT #1 back out there and with an “all new” label slapped onto it has been to color (the originally black and white) comic. 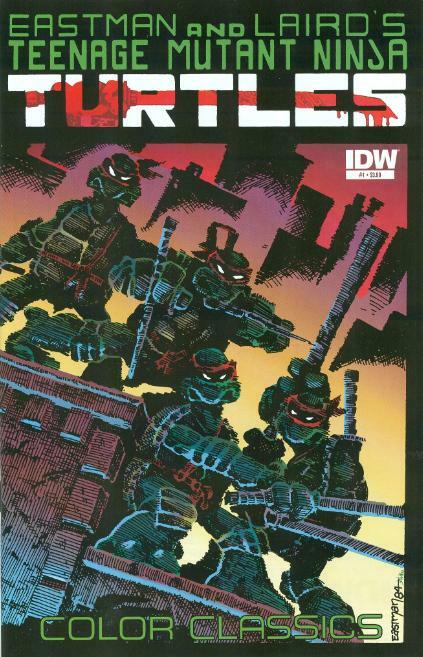 With IDW’s recent line of “Color Classics” reprints of the original Mirage series now hitting the racks, TMNT (Vol. 1) #1 has now been colorized on three separate occasions. Today, I want to take a look at each of these uniquely different takes on the coloring process of this classic and how each of the colorists interpreted particular pages, often going in radically different directions. 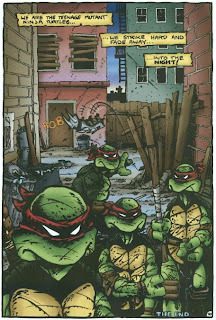 The very first colorization of TMNT #1 came in TMNT Book 1, published in 1986 by First Comics and collecting colorized versions of TMNT #1-3. The First Comics graphic novel series ran for four volumes, often utilizing many different colorists. 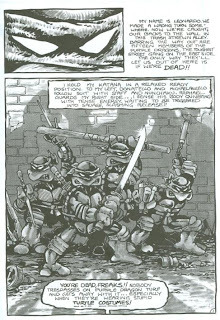 Though the credits fail to designate which colorist did which issue, Kevin Eastman cites himself as the colorist for #1 in his Artobiography, leaving Ken Feduniewicz and Janice Cohen as the colorists for the subsequent issues in the volume. 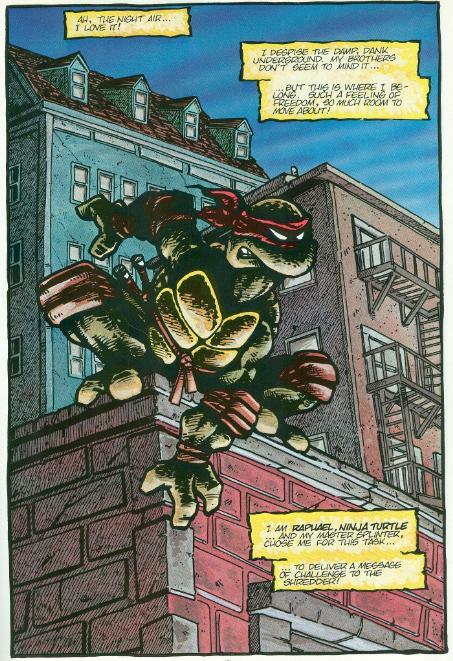 TMNT #1 wouldn’t be colorized again until November, 2009, when Mirage released TMNT Full Color #1. 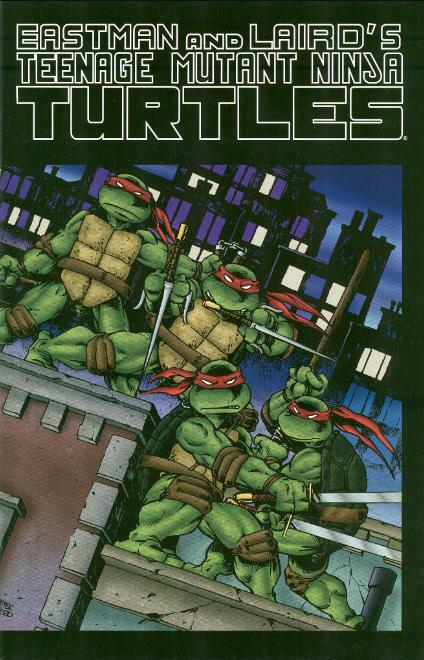 Incidentally, it would be one of the last Turtle publications Mirage would release, as Peter Laird wound up selling the TMNT franchise to the Viacom Corporation later that month. The colorist for this edition was long-time Mirage staffer Steve Lavigne. 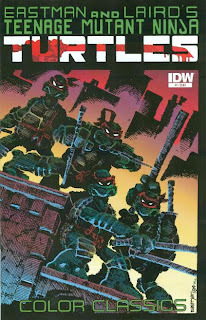 Lastly, there’s TMNT Color Classics #1, released by IDW on May 9, 2012. This release initiates an interesting marketing strategy from IDW, as they plan to recolor all of the Mirage series and rerelease them to the racks one issue at a time, later collecting them in graphic novel formats. 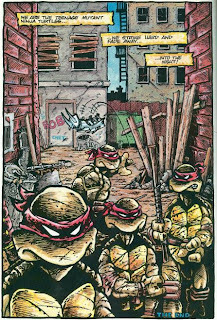 For this round of coloring, no individual was given credit, with merely “Tom Smith’s Scorpion Studios” listed as the culprits. Now, let’s get started with perhaps the most important page of the whole book: Page 1. Right off the bat, you can see how different each colorist interpreted this establishing image. Perhaps the immediate thing you’ll notice about the First Comics version is that the entire issue has been re-lettered… And not very well, I might add. 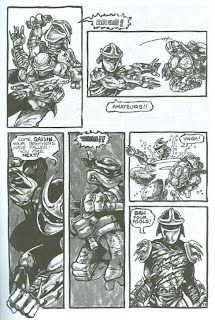 Certain words were spaced out in the original lettering to allow for emphasis, such as “turtle costumes!” being by itself rather than sharing a line with “wearing stupid”. Sure, it’s still underscored, but that was only half of the emphasis. Plus, that huge gap of white space at the top, left-over from shrinking the font size and scrunching-up the paragraph is just ugly. The next thing you’ll probably notice, after Mikey’s inexplicably blue nunchakus, is that their shadows have been removed. 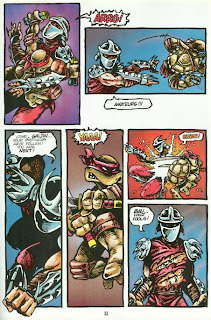 Not only that, but so have the glints from Leo’s katana and Raph’s sai. The shadows of the encroaching Purple Dragons made for a great bit of establishing danger, as they illustrated a dark menace closing in on the Turtles. If there’s one thing I do love about the First Comics version of this page, it’s the texture. That dirt is dirty, those walls are grimy, that trash is filthy; there’s a lot of detail in that environment. In fact, there’s even more than in the source! Notice the additional “bullet hole” in the brick wall on the top left, as well as the smudged text on the torn posters. 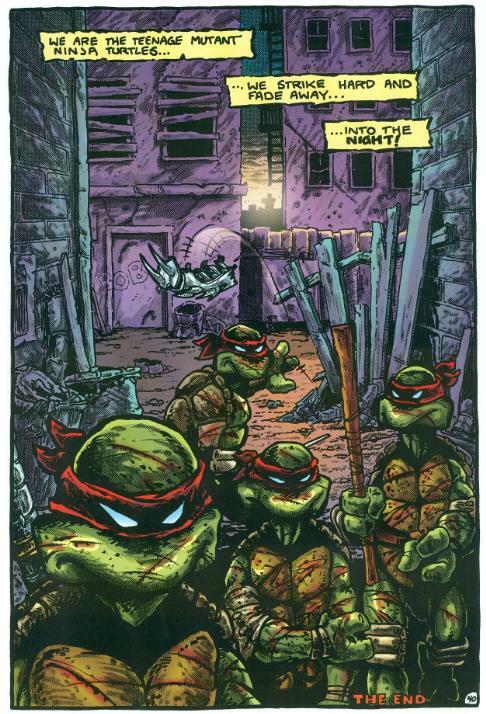 I also prefer this green-brown coloring of the Turtles over the “fresh broccoli” color the other versions gave them. Full Color #1 cleans the image up to a rather unwelcomed degree. I presume Lavigne’s intent was to “make the old look new again”, as he uses an excess of photoshop techniques to create a slick and modern appearance. While the image is very smooth, it’s so streamlined that I’d think the lines had been done with a tablet, not pencil and ink the old fashioned way 25 years ago. I don’t think he used Peter Laird’s “digitally remastered” version published in 2005 at the PBBZ Comic Con Small Press Fest, as the lettering isn’t from that version (though the cover is), but I could be wrong. The Full-Color #1 edition partially restores the shadows against the wall, but gets them wrong in the process. 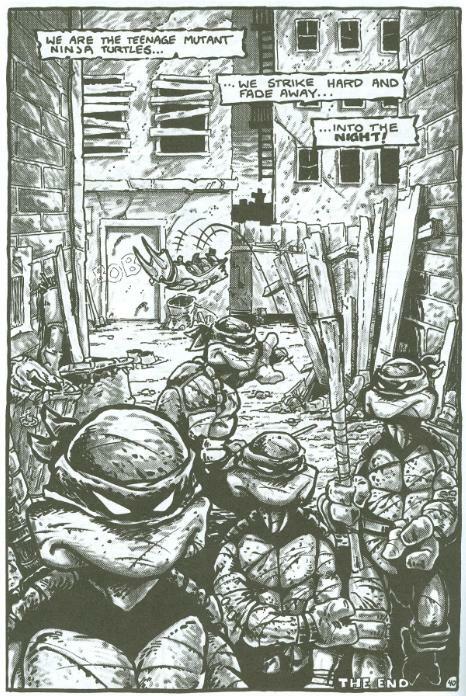 In the original, it was the shadows of the gang members closing in on the Turtles. Now, it’s just the shadows of the Turtles. 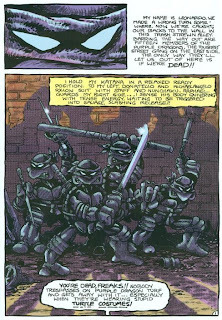 What this ends up doing is creating the impression that there is nothing between the light source and the Turtles (as there are no Purple Dragon shadows) and the threatening dialogue is emanating from the voice box of the Invisible Man. At least Mikey’s ‘chucks aren’t blue. Color Classics #1 takes the least intrusive approach, in my opinion, making no attempt to digitally “clean-up” the original line or ink work. Rather, they color on top of the duotones to preserve the original effect, with their coloring simply acting as a compliment. The shadows of the Purple Dragons have been restored to their original glory and now they completely envelope the Turtles, creating the proper moody, noir-ish atmosphere. I think if Scorpion Studios dropped the ball on anything with this page, it would be that there’s no distinguishing the posters from the bricks. I know they were trying to emphasize the backlighting/shadow effect, but it ends up looking like they just mistakenly colored the posters the same as the bricks and never went back to fix it. The added smudge-textures to the bricks are nice, though. This next page you’ll probably think a rather random selection, but it’s a great showcase of the three highly unique takes on the same scene. Page 9. First Comics does a good job of subtly painting the street lamps’ spotlights on the pavement, but there’s next to no contrast to really illustrate the fact that this is nighttime (other than the narrative box telling you so). I can almost let it go, as they’re going with an “as the sun rises” approach, but the other color editions have the same idea and execute it better. Also, notice how none of the lights in the windows are turned on? First Comics was the only edition to omit that detail. What I loathe most about this attempt, though, are the garishly colored buildings. Pink, green, blue, yellow, orange… Is this New York City or Toon Town? Lavigne’s gritless, highly flashy approach in Full Color #1 actually isn’t half bad here, as he gets the color contrast of the pavement and the sidewalk right. I dig the glow effect on the buildings in the background, as the brightness rises up from the streets between the buildings which you can’t see. He also does a better job of selling the impending sunrise as still being a little further off, whereas First Comics made it fell like it was already well past time for breakfast. The steam from the manhole cover was a nice touch, too. 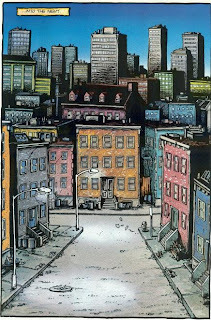 Full Color #1 also goes with the loudly colored buildings, but at least tones them down a bit so they aren’t so bright and clownish. 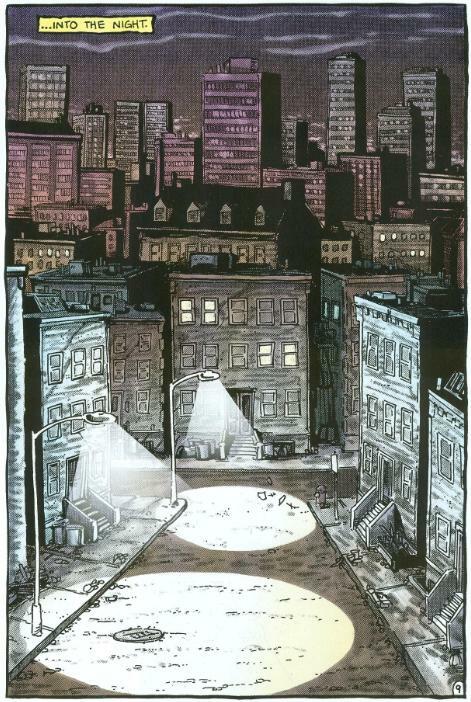 His street lamp effects are too dull and only a marginal step up from First Comics’ version. Also, notice how he restored the lights to the windows, but selected a different set of windows to be lit up? Weird. 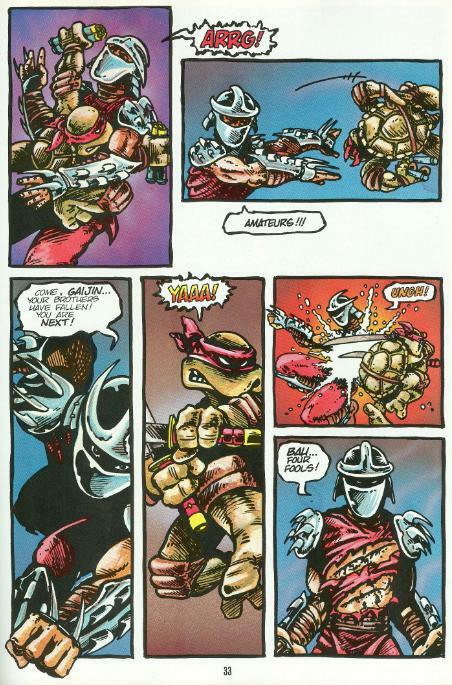 Color Classics #1 wins this page for me. Observe how it’s basically black and white on the bottom but slowly builds toward color as you move up the page? The lamp lights have their drastic contrast, which again, sets a stronger mood of mystery. They also have the best take on the sunrise. If you look at the original black and white version, you’ll notice that the sky is filled with clouds/smog, yet the previous attempts at coloring cleared the sky for either a scenic blue or a starry night. Here, the clouds mask the rising sun, creating an ominous red effect on the furthest buildings. Also, no green and yellow buildings. That’s an automatic victory. Admittedly, the original Eastman/Laird version of this page was sort of a mess of bad shadow effects and splotchy duotones. 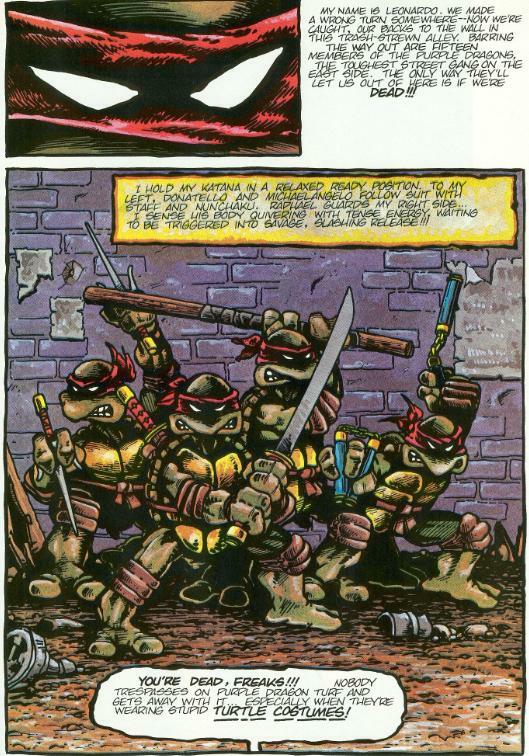 I mean, why is Raph the only thing in that image cloaked in shadow while everything else is nice and bright? It looks like he painted those shadows on before he left the lair. So as a page I never felt really “looked right” in the original version, it’s interesting to see how the different colorists tackled it. 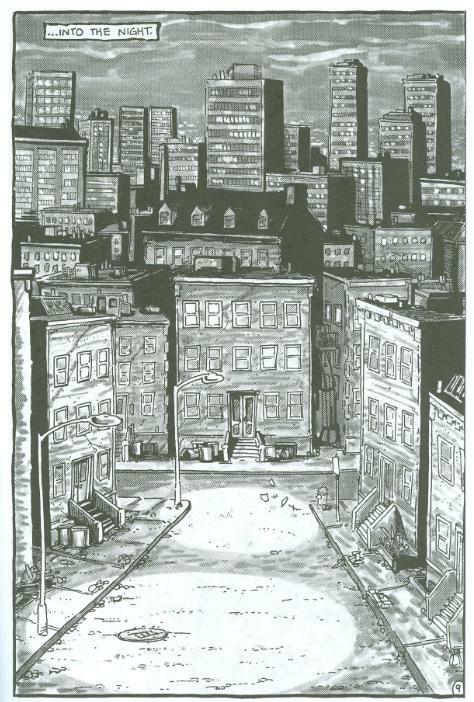 Right off the bat, First Comics cleans up all the ugly smudges on the buildings and replaces them with crosshatching. 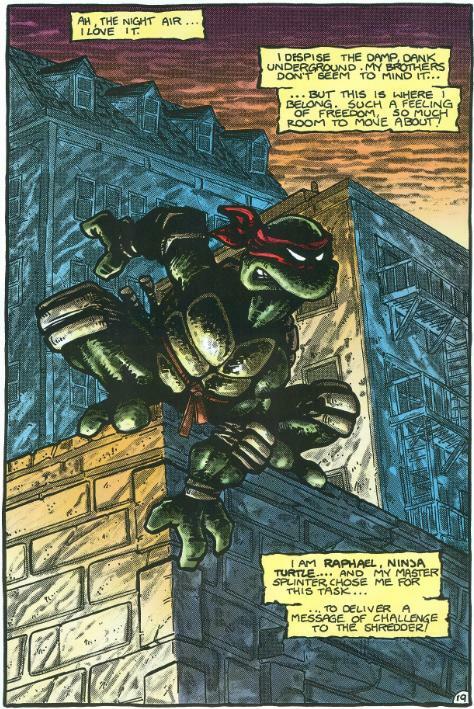 You’ll notice it’s all on the left-hand walls of the buildings to give you a better idea of where the light source is coming from and making Raph’s shadows look more “realistic”. But again, the colors are so bright that you’d be hard-pressed to believe this is really taking place in the dead of night. I know New York is the “City That Never Sleeps” and thus there are always lights on at every hour; but this isn’t Broadway or Times Square we’re talking about. Full Color #1 looks nice on the surface, but there are a few details I can’t stand. For one thing, and I don’t blame people for not knowing this, New York City suffers from some of the worst light pollution in the world. That means at no point while you are in New York City after dark will you ever, EVER see the stars. A star-filled night in New York just does not exist. 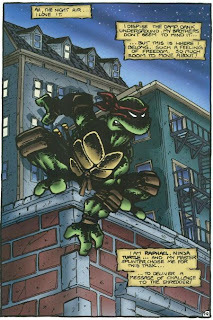 Secondly, Raph is casting a perfectly-shaped shadow of himself across two different walls that are going along two entirely different planes. There should be some major distortion, but there isn’t; even as it hits those windows in the background and its shape should be shifted as it casts over the protruding segments. If anything, it looks less like a shadow and more like Raph’s “out of focus” or something. Also, Lavigne keeps the left-hand wall as the shadowed side, so Raph is casting a shadow on a shadow. Uh huh. Good work coloring the bricks and mortar, though. No one else bothered with that kind of detail and it looks nice. Color Classics #1 takes a weird approach to the page. 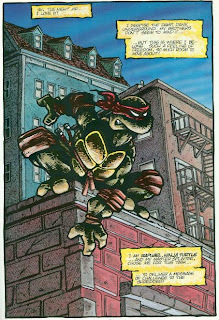 Both First Comics and Full Color #1 selected the left-hand walls to be the shadowy sides to account for Raph’s hard-shadowed exterior. Color Classics #1, however, makes the left-hand walls the lit sides and the front-facing walls the shadowed sides. At least in the fore and mid-ground; the building in the background is completely covered in darkness. What they seem to be implicating is that the lights are rising upward from the streets below (not a bad assertion) rather than from the front and to the right, where he’s looking (which is how First and Full Color interpretted it). The problem I had with this is that Raph looking toward the light-source made for a nice "something's goin' on over there" effect, as oposed to him just ignoring a light coming up from off the street. 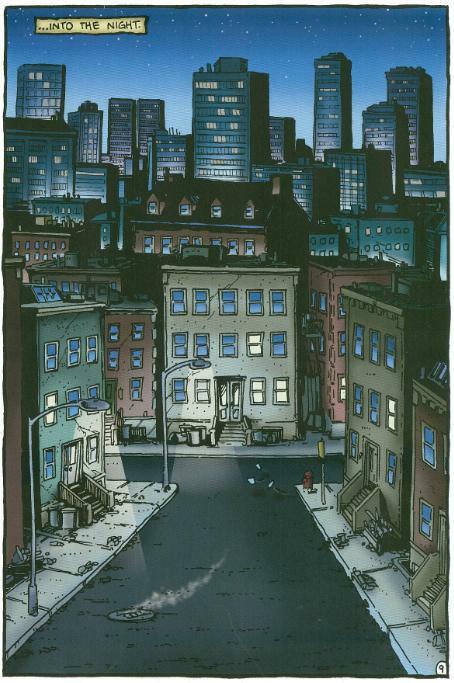 There’s also a matter that stuck out to me as I read through all of Color Classics #1, and that’s the fact that all nighttime scenes seemed to take place at sunrise. The fight with the Purple Dragons, Raph delivering his message and the final battle... There’s a persistent yellow-orange-red effect constantly indicating the gradual approach of the sun. It’s possible they meant to convey the sensation that New York is constantly alight through all hours of the night, but the aforementioned gradient effect just made everything look like dawn. 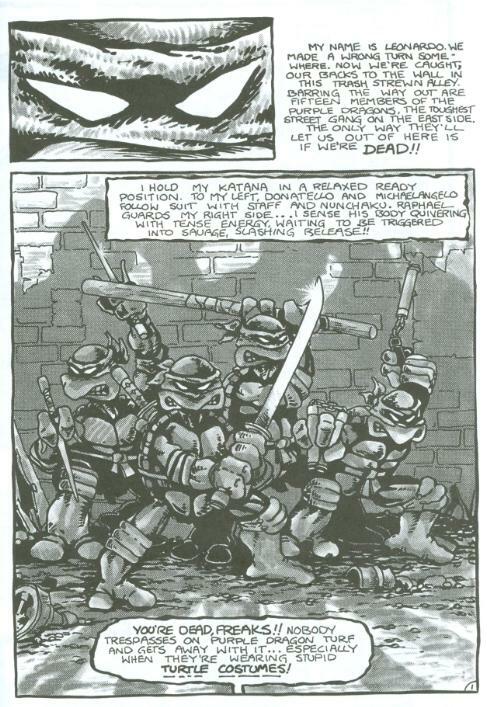 The famous Shredder intro on Page 27. Aw yeah. The First Comics version is probably the worst for a couple of reasons. The re-lettering is more noticeable here than on any other page, as the “DOOM! !” portion of the Shredder’s infamous threat gets bold text and nothing more, really diminishing the personality of the dialogue. Incidentally, Steve Lavigne re-lettered the First Comics version, yet he didn‘t use his own re-lettered version for his Full Color #1 edition. I guess he wasn’t any fonder of it than I am. Also notice that First Comics removes the buildings in the background from that first panel, leaving nothing but a mass of blue. It also removes the clouds in the background of the bottom panel, replacing them with what I assume was meant to be steam rising from below, but otherwise looks like stink wafting from the unwashed Foot Soldiers. 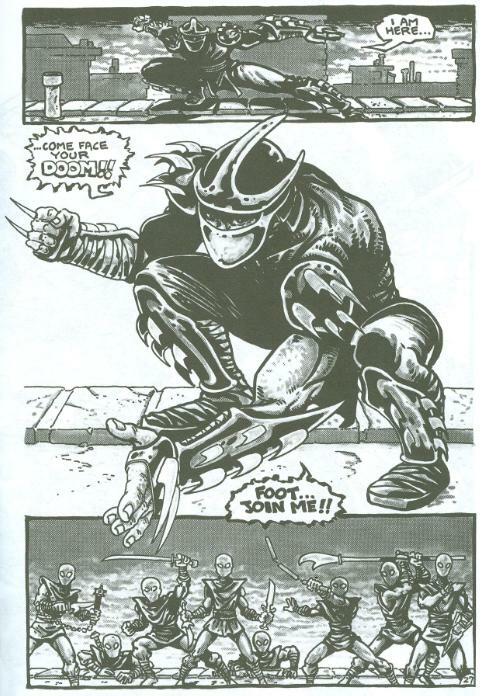 Additionally, the reddish tunics on the Shredder and the Foot Soldiers are more pink than burgundy and it all just looks ridiculous. Full Color #1 fails to restore the buildings in the top panel or the original clouds in the bottom panel, but gives us some neat stuff in exchange. The smoke from that chimney by the Shredder is really cool and we get some new clouds in the form of light and dark blue shading as a trade off. Shredder is in burgundy, thank God, and there’s a neat color gradient filling in the “DOOM!!”. 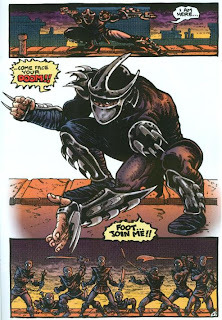 One other detail I appreciate is that only the Shredder is wearing burgundy and the Foot Soldiers are all in black/blue. It always made sense to me that Shredder would wear a color differentiating himself from his underlings so that he’d stand out. Just a cool little detail. The red eyes on the Foot Soldiers are a wee bit much, though. Color Classics #1 gives us back our buildings and our original clouds and garbs the Foot Soldiers in a single color rather than differently shaded jammies and tunics. The “sunrise” thing is in full effect and it mercifully disguises what is, in my mind, the single worst blunder of the Color Classics #1 edition which you will see in all its stupidity in just one second. Anyway, while I found the “sunrise” effect a bit irritating on account of its persistence, I can’t deny it looks really good on this page. Page 33 isn’t some iconic page like the others, but one I felt showcased the worst aspects of two of the colorized versions. 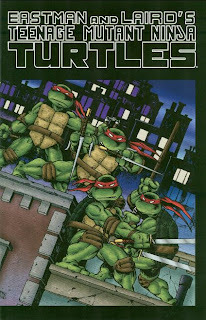 First Comics primarily produced books for the children’s market, making the over-the-top violence of Mirage’s TMNT comic an anomaly amongst their output. To keep the book appropriate for their target demographic, you can see certain concessions had to be made. Super Nintendo Mortal Kombat-style. 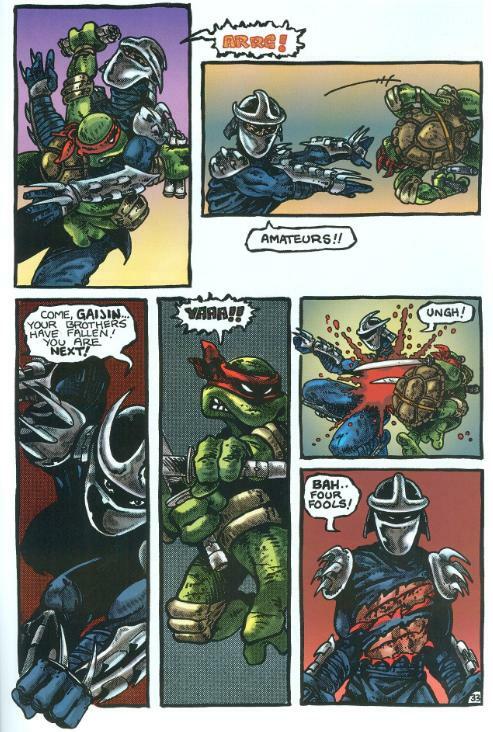 Yes, that is the Shredder getting sliced with a sword and bleeding sweat. And he does the same thing on Page 38 when Don hits him in the mouth with his bo staff. While a good amount of gore was left untouched, the First Comics edition is nevertheless a “sanitized” version. There isn’t much to say about the Full Color #1 version, as Lavigne makes no real missteps to speak of like the other two colorists. With the exception of that last panel, all the background “glow” effects are the same shade of green. 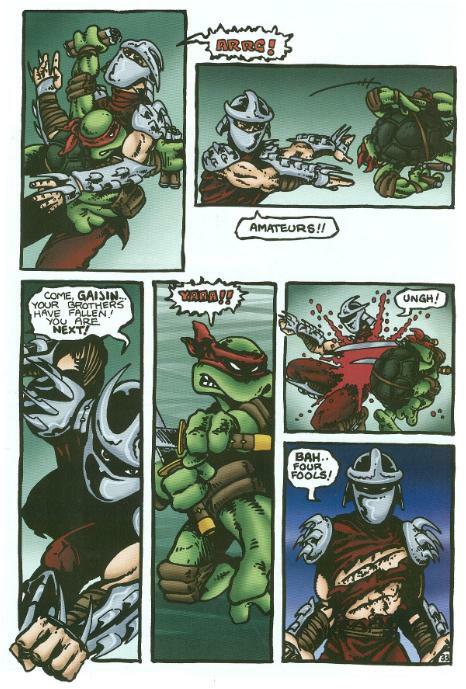 The other colorists went with different colors for each panel, which I thought made the page look kind of tacky or gaudy, so I’m pleased Lavigne basically stuck with a single color (in fact, most of the originally all-white backgrounds during this fight have the same green color in Lavigne’s version). Color Classics #1… What were you thinking? 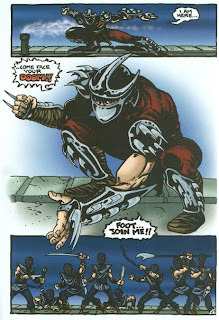 Shredder spends the entirety of this version in an all-blue bodysuit, complete with a pair of gloves he never had (you can even see his fingernails on the gloves). I cannot explain what possessed Scorpion Studios to do this, but yikes, is it distractingly wrong. I presume they used Kevin Eastman’s cover for IDW’s TMNT Ultimate Collection Vol. 1 hardcover as a source, as that cover had Shredder sporting an inexplicably blue shirt, but that doesn’t make it okay. Also, those gloves I mentioned? Sometimes Shredder is wearing them, and sometimes he isn’t (they disappear on page 37, somehow). Finally, we end our article with Page 40, the last page of the book. As with Page 1, First Comics adds many extra details and layers of nasty texture to the alleyway and I really dig all the effort put into it. You’ll even see a bonus “Chet” scribbled on the back wall beneath “BOB” which wasn’t in the original page. “Chet” was an Easter egg hidden in many issues of the original TMNT comic by the Mirage staff, as they just liked the name and thought it would be a neat gag. 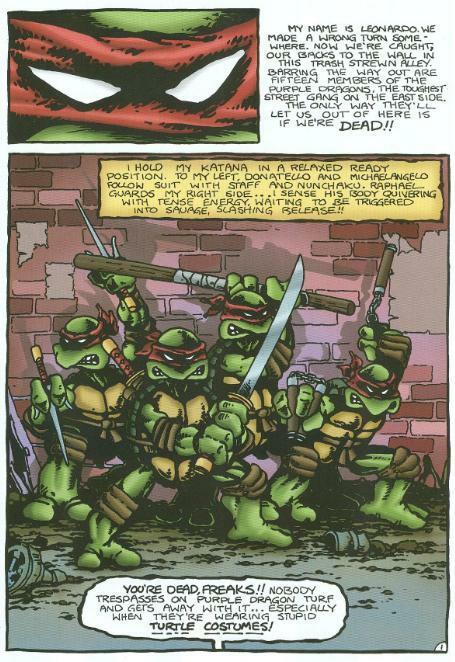 And though I still think the image is too bright, I’d once more like to point out how much I prefer First’s “brownish green” color for the Turtles. Next up is Full Color #1 which takes the exact opposite approach of First Comics; opting to “cleanse” the scene and make it less dirty-looking. 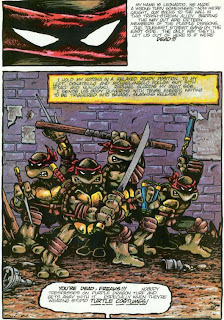 And there’s something about removing the duotones that just makes the Turtles look less ravaged by battle, somehow. 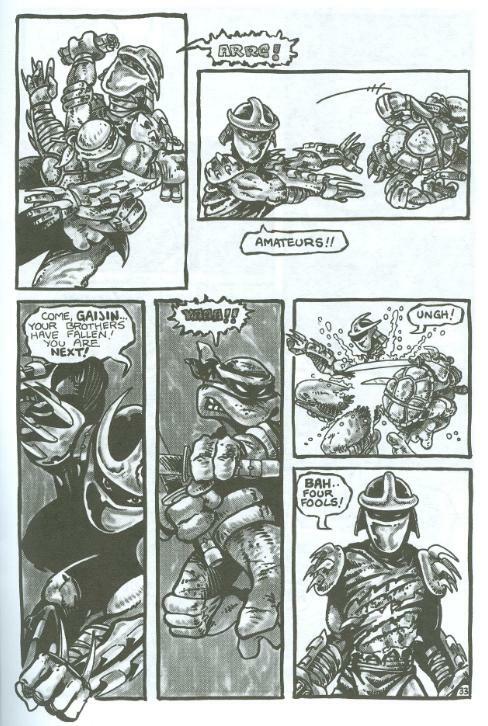 If there’s any page that needed to look positively nasty, it would be the Turtles limping home, covered in wounds, having narrowly won the hardest fight of their lives. Also, I wish Don’s bo staff had been a different color from the fence behind it, as it sort of blends into the background, becoming a part of said fence. Color Classics #1 aces this page for me. For once, I can’t fault them for incorporating a “sunrise” effect, as that was evident in the original black and white page (though considering the sun was rising all throughout their battle in this version… that was one long sunrise). The glow was a nice touch and I really dig how the light seeps between the buildings, over the fence and into the alley. 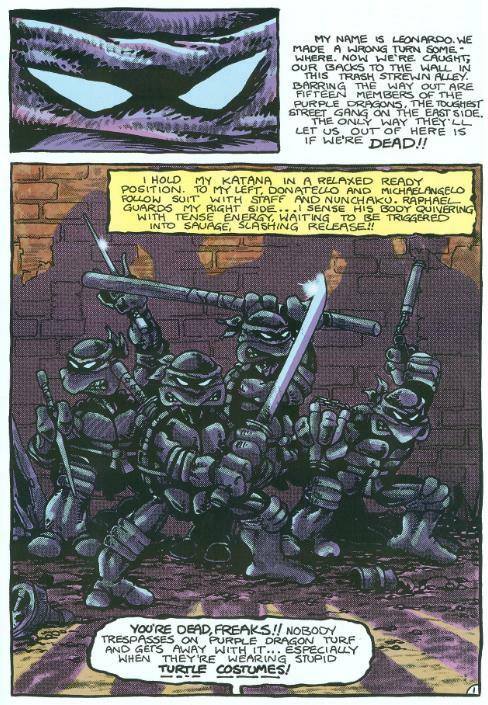 There’s a crimson highlight on all of the Turtles’ battle-scars, too, giving this final shot the “nastiness” I mentioned being key. 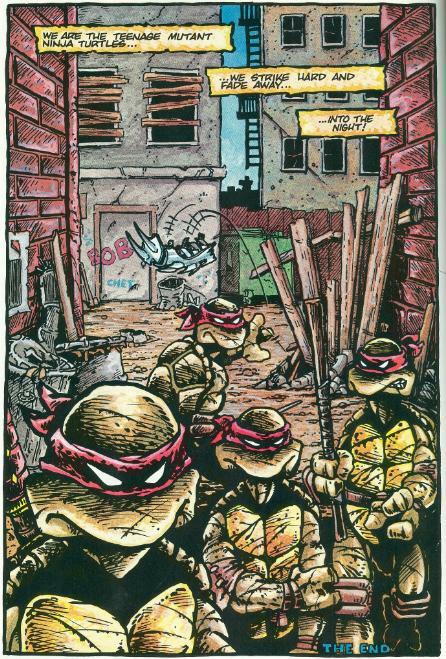 They also refrain from doing too much detail coloring on the trash and knick-knacks in the alley, which in the other versions only serves to distract from the Turtles in the foreground and the shadowy-sunrise look. Well, all three versions definitely have their strengths and their weaknesses, and obviously I am only speaking for myself (I’m sure everyone out there has their own favorite colorized version or maybe you just hate them all). Personally, while they abused the “sunrise” effect too frequently and Blue Shredder was a tremendous mistake, Scorpion Studios’ Color Classics #1 takes the cake. I found the re-lettering, overall brightness and the sanitized gore of the First Comics attempt too off-putting, though I dug the added texture they put into the environments. The Full Color #1 version was easily my least favorite, looking way too slick and smudging or erasing many of the old school effects that were like this book’s fingerprint. I liked some of the computer-enhanced additions here and there, but not many. 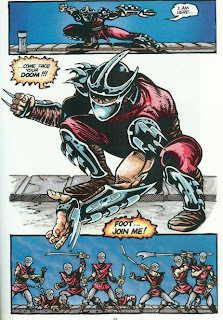 If Scorpion Studios could just fix Blue Shredder for the graphic novel collection, their Color Classics version would be just about perfect (I can live with the constant sunrises… I’ve seen enough Michael Bay movies to have gotten over that). Hmmm, I must say I still go with the original clor version. Of course there are some problems (lettering etc) but the original comic wasn't perfectly drawn, but with style. And I feel like that first color version just got that feeling the most. 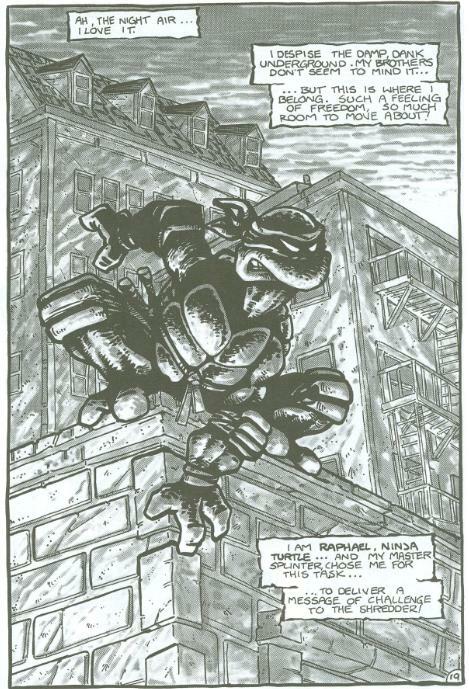 But you could actually even make a similar article about all the B&W variations of of TMNT 1. Laird redid it himself once, and it turned out ugly. The less "professional" the better I would say. Do you know about the german publications of the mirage comics? 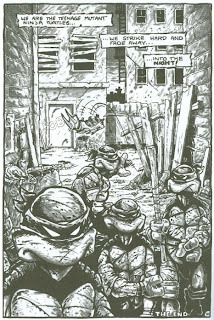 They all appeared in color an dthe series sadly stopped after the TMNT seeking refugee at Casey's house outside of NY. 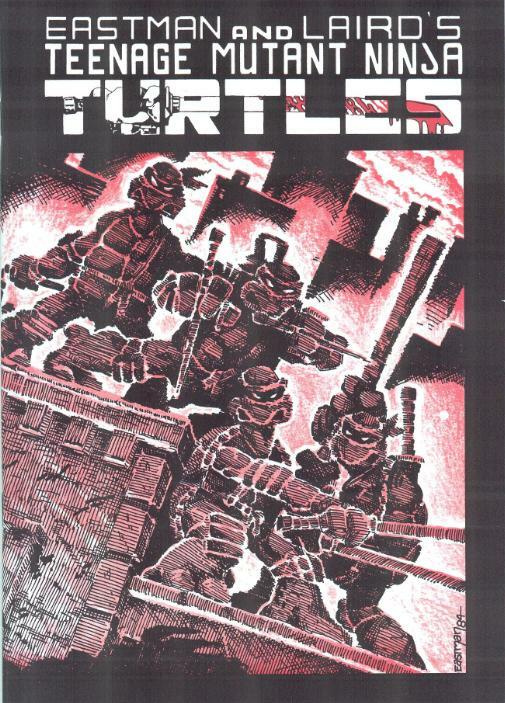 They called it "Teenage Mutant Hero Turtles Comic-Album" an dit wa sreleased by Condor Verlags Gruppe Berlin. They used the colors of the first version. So maybe that's why I like that one most, because it is the one I grew up with. 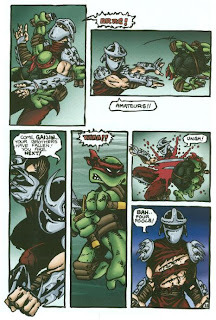 One thing I always liked about the First coloring of page 40 was the addition of teeth to Donatello. It just adds that extra bit of grit to his character during the scene. i remember seeing a similar analysis but about the different printings of number 1, it had other b&w versions. but being an older article it exclude the newer color classics edition. i can't remember where. 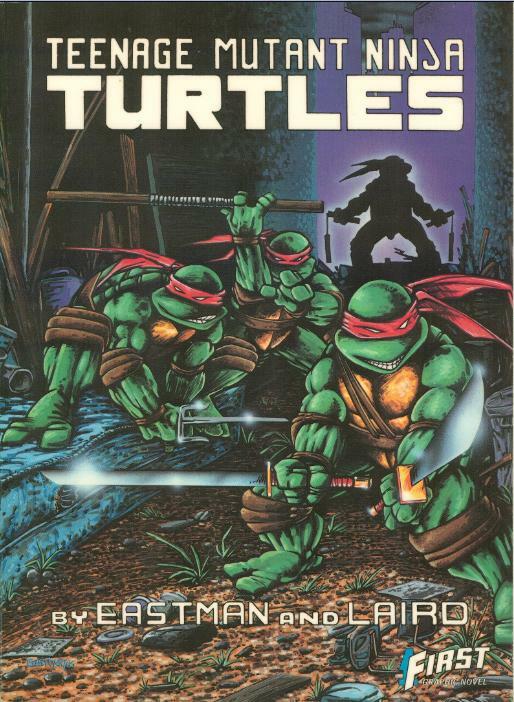 I thought the first version was down by Kevin Eastman? Anyway are you planning to do this with any future issues? I guess than you would only have two issues to compare though. How are Utroms colored? Pink like Krang? Nice write-up. 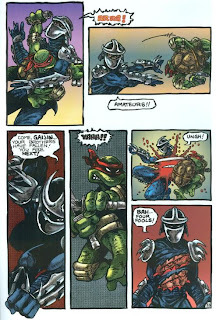 I disagree about the gore aspect though; seems to me that burst when Leo strikes Shredder isn't gallons of blood (or sweat); it looks more like an impact highlight (starburst). In that case red is the worst way to go because it makes it look like blood erroneously. But if you're right, that's some CRAZY blood. 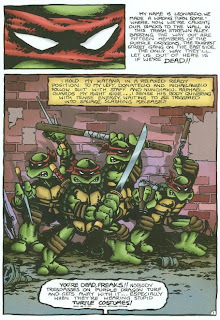 What would be the first full color image of the turtles to be published?